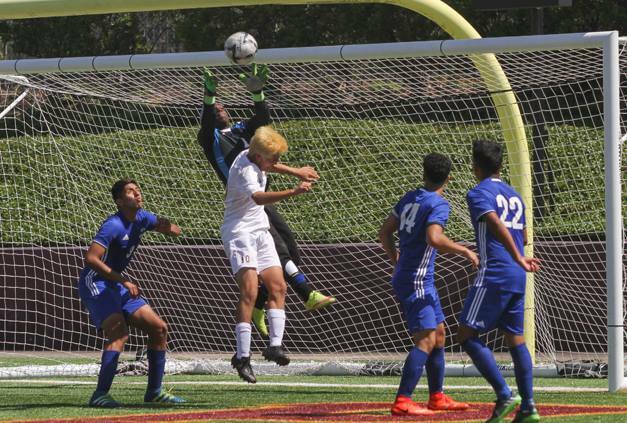 BIG NEWS: In a match that will likely go down in Longhorns lore as one of the most thrilling and intense playoff games in school history, the J. Frank Dobie High School boys soccer team defeated Channelview 2-2 (7-6) on a brilliant save by goalkeeper Ramon Cahue on the final shootout attempt by the Falcons. After playing regulation and two overtimes to a 2-2 stalemate, the Longhorns won the penalty kick shootout to claim their place as 2017 Region 3 Champions and punch their ticket to the state tournament. The Longhorns fell behind in the first half after Henry Estrada's (10) free kick found the net in the 22nd minute for the Falcons. Dobie’s Bryan Nava (16) responded by tying the game a with a goal in the 34th minute and 30 seconds later, his teammate Israel Perez (24) gave the Longhorns the 2-1 lead they would take with them into the half. Coming out of the break, both teams locked down on defense and played with passion and heart. Just when it looked like Dobie’s defense would hold the rest of the way, the Falcons’ David Sorto (7) scored the final goal with ten minutes left in regulation to tie the game. The pressure mounted for both teams as the overtime periods still left the game tied 2-2. By rule, if both teams are tied after two ten-minute overtime periods, the game is decided by penalty shootout. With both teams being evenly matched and refusing to back down, it made for a dramatic and heart-stopping finish. As Cahue deflected the Falcons last shot, Dobie’s sideline erupted as the 2016-2017 Longhorns became the school’s first state-bound team. The Longhorns advance to play Sam Houston on April 14 in Georgetown, Texas.